“I never thought I’d have to wear earplugs because of noise from the audience…” said San Diego Symphony violinist John Stubbs. But plug our ears we did for the surprise pop-up Star Wars Fan Appreciation Concert that took place last July. Every summer, thousands of self-proclaimed nerds descend on “America’s Finest City” for the world’s largest Comic-Con, a four day event celebrating everything from Doctor Who to Star Trek to Harry Potter. The San Diego Symphony has long programmed concerts that cater to the Comic-Con crowd during our Summer Pops season. This summer was to include a concert of music from the video game Pokemon, and a performance, with the movie, of the score to the latest Star Trek film Into Darkness. There was a third program that remained mysteriously vague on our calendars (kudos to the symphony’s Artistic Administrators for successfully keeping the secret so well!). When we arrived for rehearsal that morning, we were greeted by suited executives from Disney, and a non-disclosure agreement for each of us to sign. It was all very “007” of them, and I have to admit that being a part of the surprise was a thrill. We had no idea what to expect, only that J. J. Abrams, the director of the upcoming Star Wars: Episode VII, would conclude his epic panel discussion by inviting 7,000 raging Star Wars fans to our concert. As we arrived, fans started streaming from the Convention Center on to our lawn on the Embarcadero Marina Park. Techno music blared on loudspeakers as we set up our instruments and warmed up. It was a surprise, even to us, though, as the stars of the Star Wars franchise filed onto the stage in front of us: newcomers (and classmates of mine from Juilliard!) Oscar Isaac and Adam Driver, and veterans Carrie Fisher, Mark Hammill, and—excuse me while I swoon—the legendary Harrison Ford. In fact, our Personnel Manager may have had a near panic attack when, minutes before downbeat, at least a quarter of the musicians were out of their seats, desperately trying for a handshake and a picture with Mr. Ford (myself included!). As fans screamed for Kathleen Kennedy and Mr. Abrams, and a cast of A-list celebrities waved and then exited the stage, a part of me worried that our portion of the show—excerpts from the Star Wars Suites created by John Williams—would somehow fall short of the hype. There was to be accompanying video, including a personal message from Mr. Williams himself, but it was still to be a mostly acoustic performance of classical music. 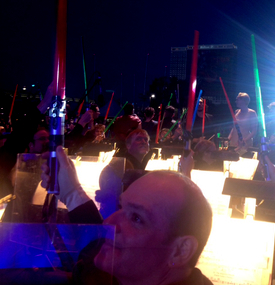 When the composer’s face appeared on the Jumbotron, the crowd went as wild as they had for Luke and Leia Skywalker. It moved me to know that the real-life person who had put music to each scene and character was as much a part of the films as any of the famous faces onscreen. As our Associate Conductor Sameer Patel took the podium, the roaring audience went completely silent. And when the pounding rhythms of the famous “Imperial March” began, the polite, quiet audience hooted and hollered viscerally and without abandon (hence the earplugs!). It was almost difficult to play, because I was so inspired to smile! The energy was beyond palpable—it was inescapable. When the softer, sensitive pieces were played, the audience would again fall silent (with the exception of some cheers when Principal Horn Benjamin Jaber played Princess Leia’s theme with a close-up of his embouchure on the Jumbotron), taking in Williams’ beautiful melodies. It’s a striking thing to be reminded of how impactful classical music can be in modern life and culture. The power and drama in John Williams’ score has endured to become some of the most recognizable music of our time. And while John Williams is best known as a film composer, his scores stand up as some of the best contemporary compositions there are. The connection that people have formed with his music is stunning. 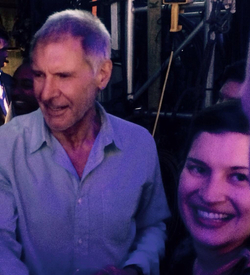 And while the highlight of my evening may have been shaking Han Solo’s hand (yes, I did! ), it was absolutely magical to share an evening of truly epic music with my colleagues, our administration, and 7,000 screaming Star Wars fans.